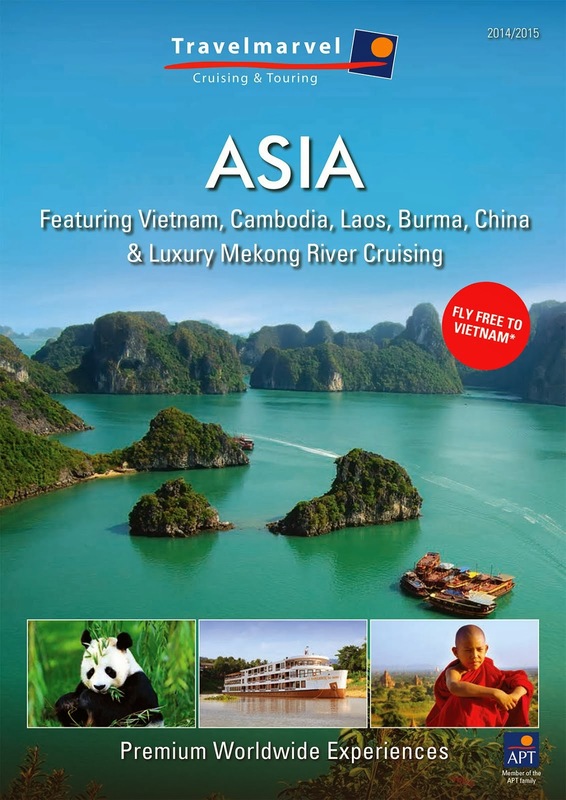 22 October 2013: Travelmarvel is expanding its Asia product, announcing premium journeys in Burma (land only) and China (land and cruise) as new additions to its 2014/15 program, which also comprises Vietnam, Cambodia, Laos and Luxury Mekong River Cruising. As well as adding new destinations to its new Asia 2014/15 brochure, Travelmarvel has doubled the number of departures of its popular Mekong river cruises aboard its luxurious ship, RV La Marguerite, offering 40 sailings for the new season. It has also lengthened its popular Ha Long Bay cruise, sailing aboard a traditional junk, from one to two nights. "We've worked hard to get the balance of our offering just right. Our sightseeing program combines well known icons with unique off the beaten track experiences, while at the same time allowing enough free time for guests to explore on their own. Add to this a portfolio of centrally located premium accommodation and a price structure offering excellent value, and what we provide to guests is an Asian travel experience that is immersive, educational, fun and most importantly, well within their comfort zone," he said. The new 68-page brochure offers 15 itineraries, two of which are new Burma land tours. The core Burma itinerary is the 10-day Charming Burma. Priced from $3,395 per person twin share, it encompasses Yangon, Inle Lake, Mandalay and Bagan. Highlights include a stay at the Pristine Lotus Spa Resort, dinner in a bamboo forest and an ox-cart ride to the Shwezigon Pagoda. This itinerary can be linked with a 12-day Mekong river cruise to form the 22-day Captivating Burma & The Mekong. New for China, Travelmarvel has introduced a core 13-day Imperial China priced from $4,495 per person, twin share. It comprises three days in Beijing, visiting the Forbidden City, Great Wall of China and a local family who live in the city's old hutongs, or alleyways; followed by a four night Yangtze River cruise aboard the MS Victoria Katarina or MS Victoria Jenna (and one departure n the MS Victoria Anna), with executive lounge privileges; and culminates with two nights in Xi'an, a night in Wuzhen and two nights in Shanghai. This itinerary is also a component of the 29-day Iconic Asia and the 24-day China, Vietnam & Cambodia Discoverer. As part of its authentic sightseeing program, Travelmarvel has introduced a range of new Insider Experiences for 2014. These include a special welcome dinner at Hanoi's KOTO restaurant (Know One, Teach One), which serves as a culinary training centre for disadvantaged youths; a two-night stay at Pilgrimage Village, boutique hotel and spa in Hue, Vietnam; and the opportunity to participate in a traditional tea ceremony in Shanghai's Yu Yuan Gardens. Travelmarvel Asia holidays are priced to include all accommodation; sightseeing; the services of a Travelmarvel tour or cruise director; most meals; internal flights; airport and hotel transfers; gratuities; free flowing local beers, spirits and soft drinks and international wines with both lunch and dinner on all Mekong cruises; and selected alcoholic beverages at dinner on all Yangtze cruises. Lead-in itinerary is the 12-day Essential Vietnam & Cambodia. Priced from $3,695 per person, twin share it comprises two nights at the Shinta Mani Resort in Siem Reap, followed by a seven night luxury Mekong river cruise and two nights at the Grand Hotel in Saigon. Travelmarvel is offering a range of highly competitive 'Fly Free' deals across its new Asia portfolio. For example book any Vietnam cruise holiday of 12 days or longer, in any suite category, departing June 2014 to April 2015, you'll fly free including taxes, a saving of up to $3,950 per couple. Alternatively book any China holiday departing June 2014 to March 2015 and your companion will fly free, including taxes, a saving of up to $1,660 per couple. These deals are valid on bookings made by 31 March 2014 and are subject to availability. Terms and conditions apply. Agents phone 1300 300 036, visit www.travelmarvel.com.au or contact your local business development manager.